The best way to see the city of St. Augustine is by a ride on Old Town Trolley. Once you have the ticket then you can select where you want to go and hop on and hop off. When traveling to the Oldest City in the continental US, we parked the car and headed out from our hotel base at the St. Francis Inn. With narrow streets and limited parking, this is by far the easiest way to get around. The best bang for your buck is that the trolley ticket is good for three days so it allows plenty of time to get on and off at those spectacular sites that only a city with this much history can offer. We rolled out of bed early and caught the first tour of the day. With only a few of us on board, we received the undivided attention of tour guide Jim Kimbrough who kept us enthralled as we learned about the city founded by Pedro Menendez de Aviles in 1565. He described the history and significance of all the wonderful stops along the way. 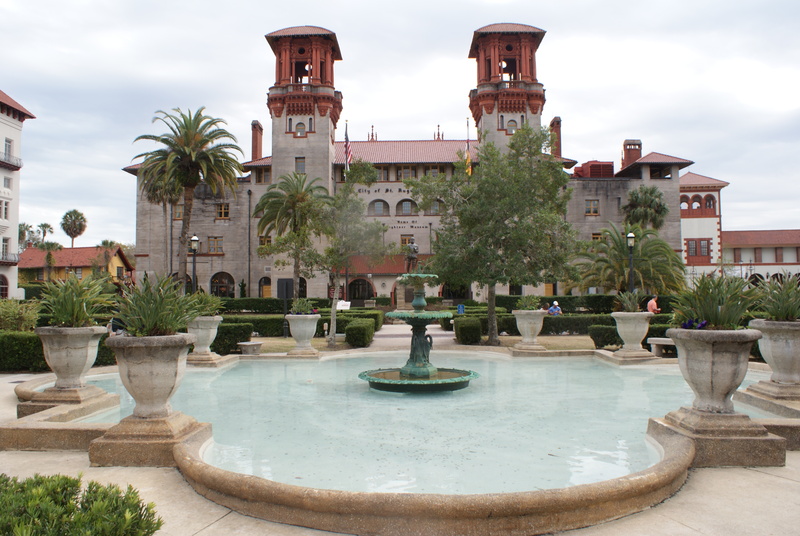 While unable to take the time to stop and tour everywhere we were able to view the former hotel turned college built by rail road magnate Henry Flagler shown in the picture above, we saw a tree over 600 years old tucked away in the parking area of a hotel, spied the fountain of youth, where the first landing was and one of the ten most beautiful streets in America plus so much more. The trolley drive offered what Jim called “Transportainment” and regaled us with the history and unique aspects of the Spanish, English, American and Indian cultures along with the doomed French arrivals. The tour has been in business in St. Augustine for over30 years and offers with 22 stops and more than 100 points of interest. Check out the website for details at http://www.trolleytours.com/st-augustine/day-tour.asp. Previous Post: Living it up at Meehans!